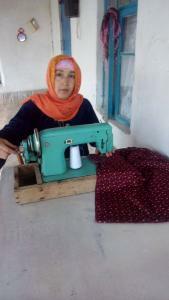 to buy a new sewing machine in order to expand her business. Bibisoro benötigte 550 US-Dollar, um ein Gewerbe im Bereich Dienstleistungen auf- oder auszubauen. Das Geld wurde gesammelt und für Bibisoro bereitgestellt. Bibisoro is a 32-year-old woman with a husband and two children. Her husband works in a bakery making Tajik flatbreads. She and her family live in the Khuroson district. She is a tailor by profession. She has been sewing traditional women's clothing for three years. Now, she would like to expand her business and is asking for a loan to do this. She is planning to buy a new sewing machine, with the help of which she will be able to improve the quality and profitability of her work. She hopes for this loan.